It's been a while since I last shared a baking post! Looking back at last year I discovered lots of new recipes that I had found either online, in magazines or in some of my cookbooks and I had so much fun trying out all these new recipes and started to see a much more bigger improvement with my baking skills. I'm definitely looking forward to getting stuck into baking on a more regular basis again! I've set myself a few simple baking goals this year. One of them being to photograph and document each bake, as I've been wanting to get into taking more food photography. I like making note of what recipes work best and whether I've made any changes so I definitely want to keep on track with that! My second goal is to get better at baking bread and start making more savoury foods. I've never mastered making bread, so I really want to keep going and get more practise. I'd also love to get into making savoury scones, garlic breads and muffins! So onto this weeks bake. 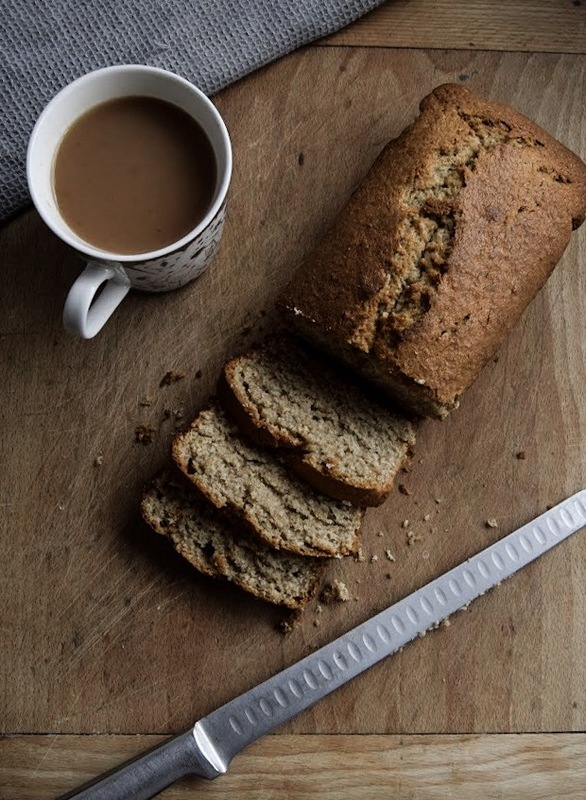 I've kick started this years baking with a simple, but super delicious wholemeal banana bread. The recipe is based off a Mary Berry recipe which you can find here, which is probably my most favourite banana bread recipes of all. 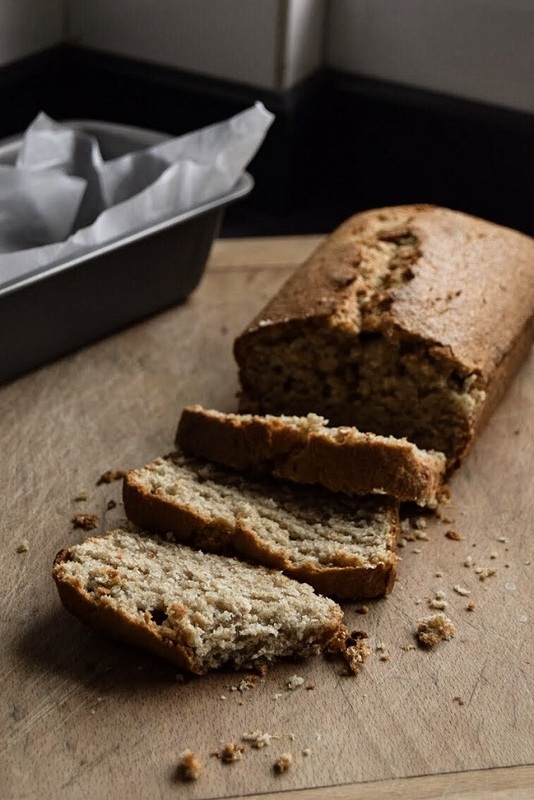 The original recipe uses a regular self-raising flour but I thought it would be a good idea to try out a wholemeal flour instead, which adds a slightly nutty taste and texture to the loaf. 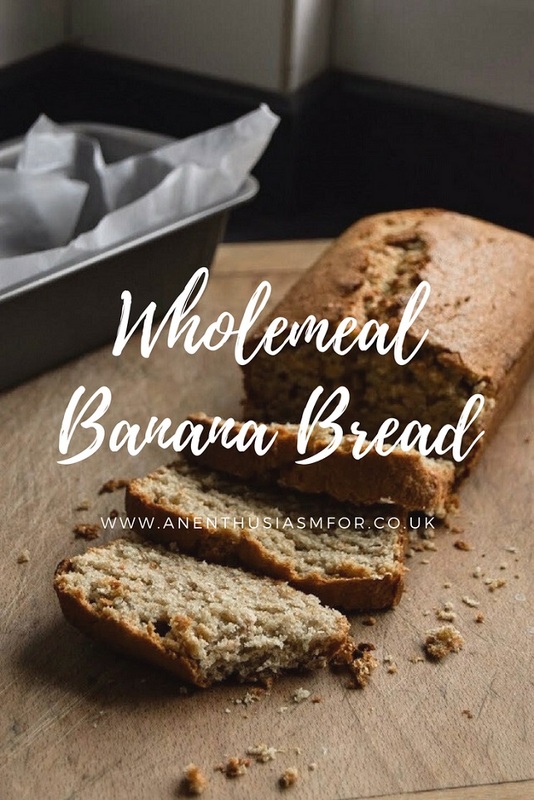 You could follow the original banana bread recipe or go wholemeal, either way is still perfectly delicious! 1. Line a 900g (2lb) loaf tin with baking parchment. Pre-heat the oven to 180C/160C (fan)/350F/Gas Mark 4. 2. In a large bowl cream together the butter and sugar until soft. Add the flour, baking powder, eggs, mashed bananas, milk and beat together using a hand whisk for around two minutes or until fully combined. You can also beat by hand using a wooden spoon. 3. Once the mixture has been combined together, spoon the mixture into the loaf tin and bake in the oven for around 1 hour until risen and golden brown. I found that my wholemeal loaf baked a little quicker at around 50-55 minutes, but this can be depending on your oven. To check the banana loaf is fully baked, a skewer or knife into the centre of the loaf will come out clean. 4. Leave the loaf in the tin for a few minutes or so, then move to a wire rack to cool completely.